Install your HTML email signature in no time! Follow our step-by-step guides to install your email signature in Freshsales CRM. It's never been easier to create a new email signature for Freshsales CRM. Check out our beautiful email signature templates and easy to manage email signature software, that makes creating email signatures for Freshsales CRM a breeze. Login to your Freshsales CRM account. Follow our Step-by-Step Guide below for full instructions on installing your email signature within Freshsales CRM. If you run into any issues during your HTML email signature installation in Freshsales CRM, please see the Troubleshooting FAQ for frequently asked questions, before contacting support through your member account. Switch across to your web browser and your Freshsales CRM account, then from the top right of your screen, click on your Profile icon and select Profile Settings. 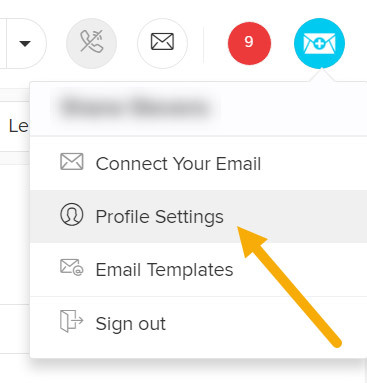 From your Profile page you will see your User Details with your Email Signature field beneath that. Click the Source button from the toolbar at the top left, then click inside the box and press Ctrl + V to paste your copied code. Click the Source button again and you will see your email signature appear. It's likely that you may see some borders around your email signature, this is normal as it's the outline of the table and cells that hold your signature together. These lines will not show when you send your emails. Click the Save button to the bottom right of your signature setting to save your changes. If you have tried our Step-by-Step Guide for installing your email signature in Freshsales CRM and you run into any issues, please read through this troubleshooting guide before contacting Support for further help. We aren't currently aware of any other issues with installation in Freshsales CRM. If you experience any other issues, please get in touch with our Member Support Team through your Email Signature Rescue account using the red help button.